Background: Nepeta species is a rich source of phytochemicals with multiple pharmacological activity. The aim of the present study was to study the cytotoxicity and pro-apoptotic activity of Nepeta binaloudensis different extracts and essential oil on prostate (PC3 and DU-145) and breast cancer (MCF-7) cell lines. Methods: To explore that cytotoxicity and apoptosis inducing activity, resazurin assay, propidium iodide (PI) staining of cells and western blotting analysis of PARP, Bax and Cyt c were performed. Results: Estrogen receptor (ER)-positive PC3, and MCF-7 cells were found to be more sensitive to N. binaloudensis in comparison with hormone-refractory DU-145 cells. Methylene chloride extract and the essential oil of N. binaloudensis showed the highest cytotoxicity (IC50 < 100 µg/mL). 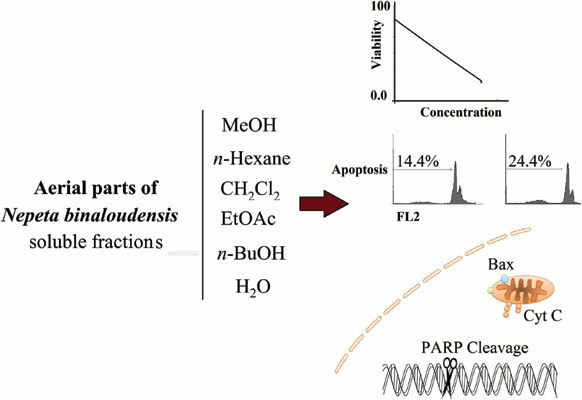 The amount of cytochrome C and Bax protein increased, and PARP was cleaved with methylene chloride fraction and essential oil of the plant which confirms induction of apoptosis. Conclusion: The present results suggested cytotoxic and apoptotic activity of N. binaloudensis on ER-positive breast cancer cells. Further phytochemical investigations are required to find phytochemical( s) with potential anti-tumor activity in this plant. Nepeta binaloudensis, Lamiaceae, cytotoxicity, apoptosis, essential oil, propidium iodide (PI).